Heigham is about as close as it is possible to get to Norwich city centre without actually being in Norwich city centre. The inner ring road cuts through the east of it, and the historic parish includes the vast Catholic Cathedral of St John the Baptist. Today, it is a mostly pleasant, 19th century suburb, with lots of student accomodation for the University of East Anglia, which is a bit further out from the centre at Earlham. The medieval parish church of Heigham, St Bartholomew, was destroyed by German bombs in the Second World War. It was in the north-west of the parish, and ruins survive; but even in medieval days Heigham must have been joined to the walled city. Indeed, Pottergate continues westwards until it reaches just to the south of the site of St Philip in Heigham Road. George Plunkett's photograph, on the left, shows St Philip on a sunny July day in 1962. As you will see above from my photograph taken at the same spot in 2006, it is no longer there. 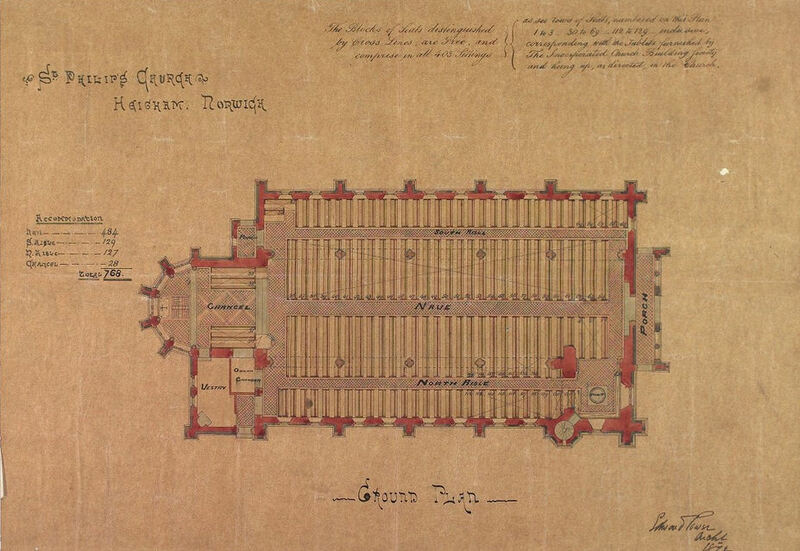 According to the original church plan at Lambeth Palace library, St Philip was the work of the architect Edward Power in 1872, although this date is probably not quite right, as we shall see. The tower and west end fronted Heigham Road, as in George Plunkett's photograph, and an apse was at the far end. The church was built to serve the south of the parish, which was substantially built up along Earlham Road and Unthank Road in the second half of the 19th century. The church had seating for 768 people, and the arrangement of the chancel in the apse appears to show that it was intended to be High. St Bartholomew and St Philip were followed by another Heigham church, St Barnabas, in 1906, and then came the Blitz. Rather than rebuild St Bartholomew, it was left as a picturesque ruin in the graveyard, and the Anglican parish took on the disused Methodist church nearby, which was rededicated as the new St Bartholomew. And then came the 1970s, and the Brooke Report. 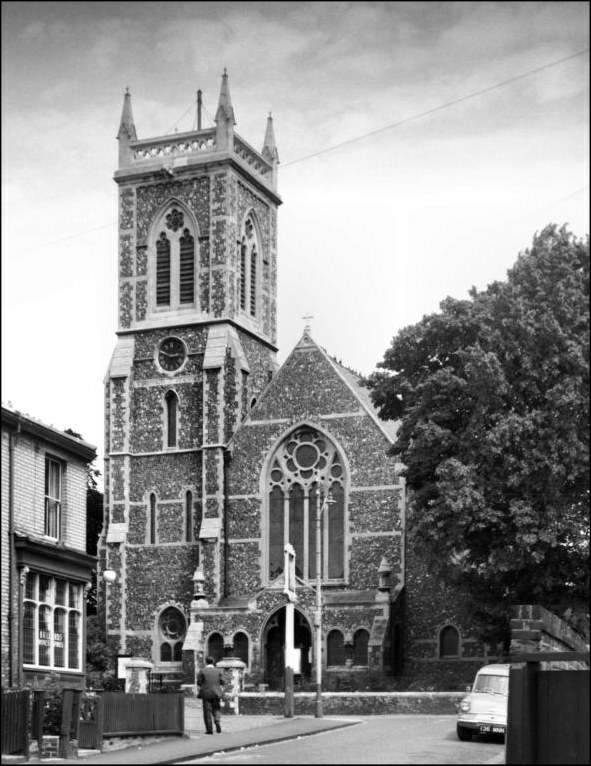 Norwich, famously, had far too many Anglican churches for its population, and the great majority of them were closed. One of them was St Philip. 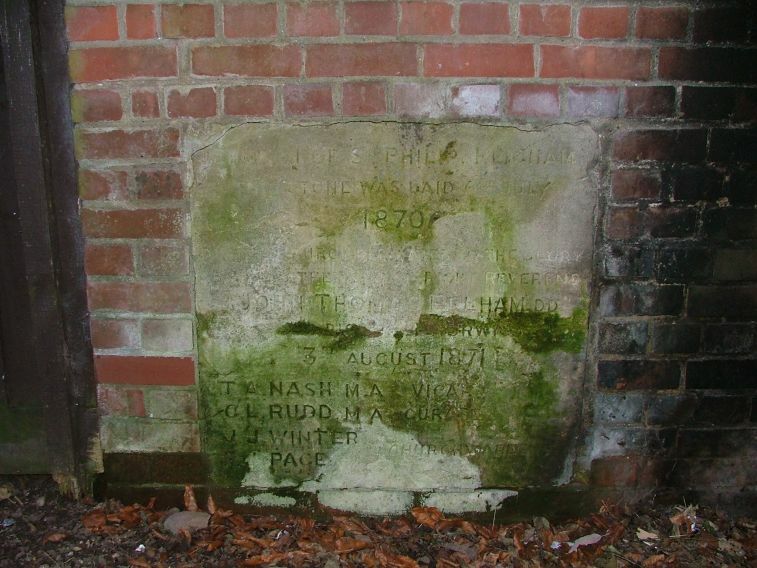 Three years passed, but no new use could be found, and in accordance with the prevailing laws about redundant churches, it was demolished in 1975. Peter Stephens and I had both been trying to work out the exact location of the church, because there are some Victorian-looking church ruins in the grounds of the adjacent Catholic school. However, it turns out that these are remains of a folly that stood in the garden of the big house that was once here, possibly the original vicarage of St Philip. It wasn't until we came across George Plunkett's photograph that we could be sure. 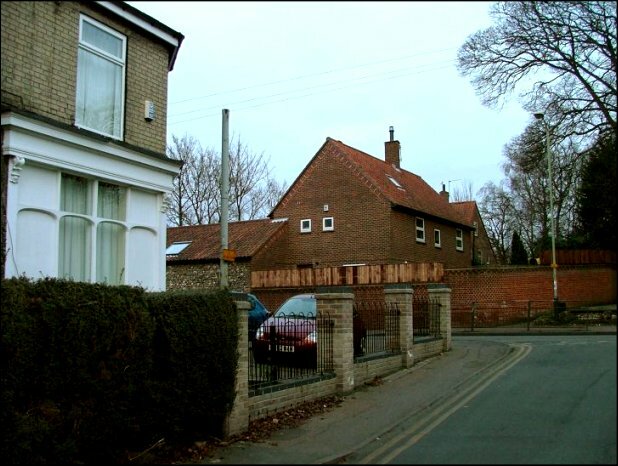 Standing in Stafford Street, it was possible to line up the pub on the corner (now a private house) with the other side of Heigham Road, and see exactly where the church had been. The point of the gable of the house is in almost exactly the same place as the point of the gable of St Philip. Several large 1980s houses now stand on the site, but far from being some kind of executive housing estate this is actually a little Ecclesiastical close, home to a number of Priests who work for the Norwich Diocese, including the Vicarage of St Giles. Nothing now remains of the mighty 19th century church that once stood on this spot - or, almost nothing, for a kindly Priest led us through into his back garden where, set in a wall, was the original dedication stone from the church of St Philip, which had been put in place on the very day that work had begun, 136 years ago.